Want to have a little fun with your home; adding a little Spark to your Space is as easy as 1, 2, 3! One house can have two looks. Find inspiration from what you love. And if you are thinking of moving or preparing for a renovation, getting expert advice is easier and more cost effective than you think! Call Catherine at (604) 828-5033 today. Sign up for TRIO's Newsletter and receive my free e-book. 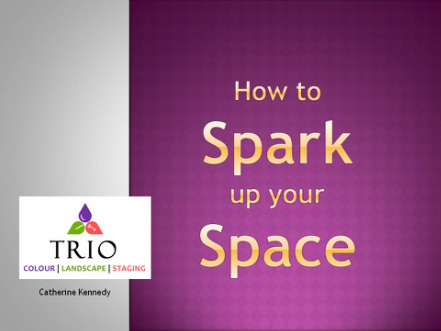 Use the contact form below to subscribe to my quarterly newsletter and as a thank you, I will send you my free 28-page e-book that will give you some great ideas on to How to Spark up your Space! Newsletters will feature: Before and After Projects, Curb Appeal Ideas as well as Tips and Trends for the Home Owner or Seller. FYI: New spam laws require your permission, Mail Chimp will send you a confirmation email before I can send you the newsletter and e-book. You may unsubscribe any time. Thanks!